"I got this recipe from my sister, whom I nicknamed Cheese when we were little girls. Now that we're adults, the name still sticks and my children call her Auntie Cheese. 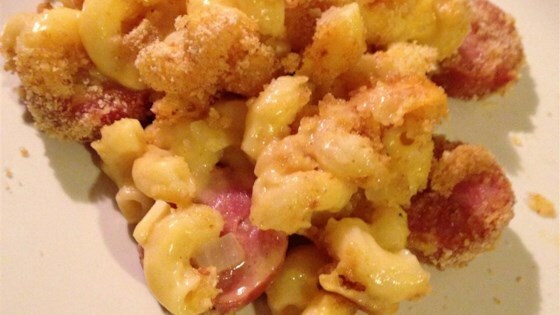 Needless to say, with a nickname like Cheese, her Baked Mac and Cheese is definitely the best around." Cook and stir the cut-up kielbasa in a large skillet over medium heat for 6 to 8 minutes, until heated through and beginning to brown. Remove the sausage from the skillet, and set aside. Fill a pan with lightly salted water, bring to a boil over medium-high heat, stir in the macaroni, and return to a boil. Cook, stirring occasionally, until the pasta has cooked through but is still firm to the bite, about 8 minutes. Drain well. Melt the butter in the skillet over medium-low heat, and cook and stir the chopped onion for about 5 minutes, until translucent. Whisk in the flour, stirring constantly to avoid lumps. Cook and stir the butter, onion and flour for 2 to 3 minutes to make a roux, and remove from the heat. Whisk in the milk a little at a time, stirring constantly, until all the milk has been incorporated, and return to low heat. Bring the sauce to a simmer, and cook over low heat for about 2 minutes, stirring constantly, to finish cooking the flour. Whisk in the Cheddar cheese, a few cubes at a time, until all the cheese has been incorporated and the sauce is hot and smooth. Pour the macaroni into the cheese sauce, and stir to combine. Stir in the cooked kielbasa, salt, and pepper. Spoon the macaroni mixture into the prepared baking dish, and sprinkle the bread crumbs over the top. Bake for about 20 minutes in the preheated oven, until the crumbs are brown and the casserole is bubbling. Let stand for 15 minutes after baking, to set before serving. I tend to make this a bit differently from my sister... extra cheese, less onion, and crushed crackers instead of breadcrumbs. But it's a great base recipe! This was ok but wasn't very cheesy and I added extra cheese to it. Next time I will add a cheese like velveeta to help make it creamier and cheesier.